Utilitarian scooters like the Honda Activa and Suzuki Access have the highest market share in the segment in spite of the availability of many fancy options. They are less sensitive to age, gender and size of the rider due the unisex styling and roomy proportions. The Jupiter marks TVS’ entry into this sub-segment and, going by the above incident, looks like they have got the recipe right. Let’s dig in. The Jupiter’s front apron is sharp, with vertical turn indicators and a triangular grille in the centre to break the monotony. The large steel panels and ‘Jupiter’ decals on the sides give a sturdy feel to it, and the tail-light cluster employs LEDs. The Jupiter also has 12-inch alloy wheels with five twin-spokes covered in black paint, and shod with tubeless tyres. Attention to detail is evident in the fitment of panels, the quality of paint, the stitching on the seat, ergonomics and high quality of plastic and switchgear, all of which give the scooter a premium feel. 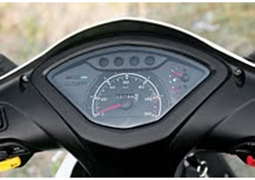 As for the special features, the head unit has pilot lamps and the headlight switch has a pass-light function, a first in scooters. There is a rear brake lock on the brake lever, a keyhole lock to prevent tampering with the ignition and the external fuel filler is located above the tail-lamp, so that the rider doesn’t have to dismount at the petrol pump. The seat of this scooter is wide and comfortable and the saddle height of 765 mm won’t be an issue for short riders. Tall riders will find enough room for their knees and the scooter can accommodate two adults comfortably. The 110-cc, single cylinder, air-cooled engine of the Jupiter is a refined unit and is mated to a variomatic transmission. 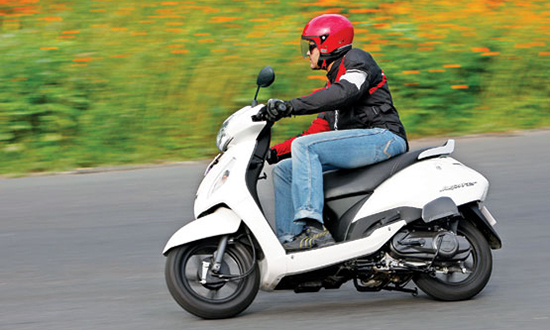 The power and torque output stands at eight PS at 7,500 RPM and eight Nm at 5,500 RPM, the same as in the Wego. Low and mid-range performance is good, while the top speed is almost 90 km/h. The Jupiter employs 130-mm drum brakes on both the wheels, which provide good stopping power. 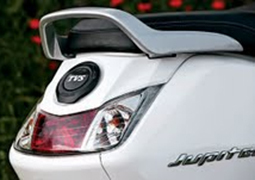 TVS claim that the Jupiter’s fuel efficiency is 62 km/l and the ‘Econometer’ lights on the information panel help keep the throttle input in check for getting the best fuel efficiency. Telescopic forks take care of the front suspension of the scooter while the rear wheel is suspended by gas-charged shock-absorbers with coil springs, another unique feature of the Jupiter. Overall, the Jupiter has a few useful features, but does not stand out as a ground-breaking scooter. 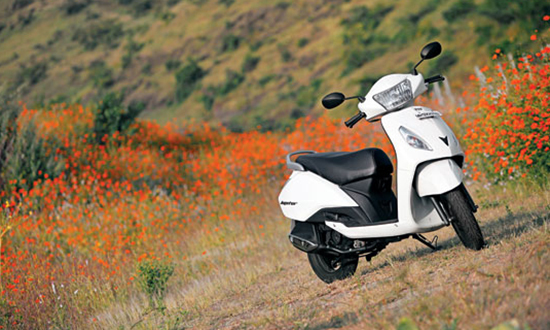 Nevertheless, it matches the standards of the best in its class and has all the qualities of a good scooter. It does lag behind in fuel efficiency, but compensates for that with its reasonable price-tag of Rs 54,805 (OTR, Pune).